Farming and gardening activities often require the use of ladders to access work areas or materials that exceed the worker’s reach. Tasks such as pruning, building maintenance and accessing stored materials are common occurrences, but little thought is given to the potential hazards resulting from ladder misuse. Many ladder incidents occur when a worker falls from a ladder or when the ladder falls because it is being used incorrectly. Ladder incidents can lead to serious injuries and fatalities, so it is important to know which ladder is best suited for the task at hand and how to appropriately use it. • Verify that the type of work to be performed matches the ladder’s capabilities. Read and follow all manufacturer instructions. • Be certain the ladder is able to carry the amount of weight that will be applied. Check the ladder’s ratings for weight allowed. ◦ Industrial: Heavy-duty with a load capacity of not more than 250 pounds. ◦ Commercial: Medium-duty with a load capacity of not more than 225 pounds (suited for painting). ◦ Household: Light-duty with a load capacity of 200 pounds. • Check the condition of the ladder before every use. • Place the ladder on a firm, level, slip-free surface away from hazards such as algae growth, oil spills, potting mix or wet grass clippings. • Check for overhead power lines when outdoors, and remain clear of them. • Be certain the spreader is locked before climbing on the ladder. • Do not ever stand on the top of or the top step of the stepladder. • Do not use the ladder in the closed position, leaned against an object being climbed. • Raise the extension ladder to the desired height and lock both sides. • Use a spotter or someone securing the base of the ladder, if base security is in question. 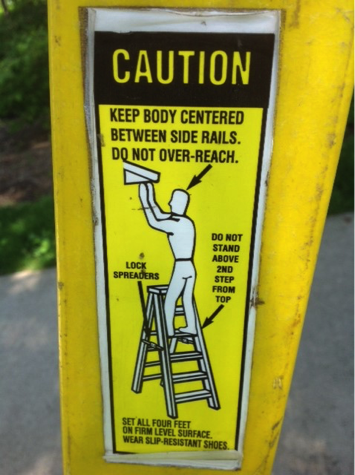 • Do not ever stand on the top three rungs of a straight or an extension ladder. • Do not ever lean the ladder against a movable object. • Face the ladder and hold onto the side rails with both hands when climbing up or down. The ladder should be placed according to the “four-to-one” rule. First, measure or estimate the rise of the ladder: the height from the ground up to the point where the ladder rests against the object. For every 4 feet of rise, the base of the ladder should be 1 foot away from the object. 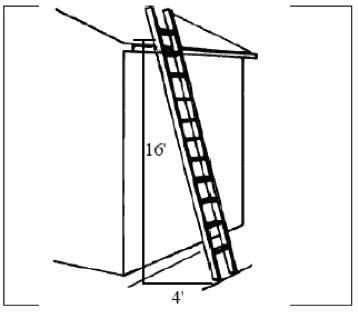 For example, if a 16-foot ladder leans against a wall, its base should be placed 4 feet from the wall. • Use tripod orchard ladders specifically for pruning and harvesting operations. • Be aware that an orchard ladder has three points of contact with the ground: two feet at the base of the steps, and a single back leg that should be placed on soft, uneven terrain. 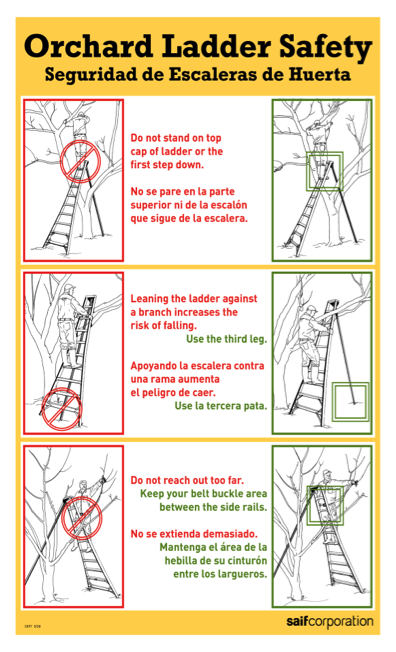 • Do not place orchard ladders on firm, smooth ground, as they may tip or collapse. • Do not use orchard ladders as general purpose ladders. • Do not ever use the top of the ladder as a step. • Center your body between the rails of the ladder. • Maintain three points of contact while on the ladder (i.e., feet and one hand). • Do not carry materials in your hands when climbing up or down a ladder; use a tool belt or a pocketed apron. A rope and bucket can be used to hoist materials if climbing to a stationary location (i.e., roof or loft). • Make sure that only one person is on the ladder at a time. • Secure and tie ladders down when working in strong winds. • Use a wooden or fiberglass ladder if work must be performed near power lines. • Do not ever work with a metal ladder around power lines. • Jepsen, S.D., Michael Wonacott, Peter Ling, and Thomas Bean. Tailgate Safety Training for Landscaping and Horticultural Services: Proper Use of Ladders, AEX-192.1.46. Columbus, OH: Ohio State University Extension, 2006. • Jepsen, S.D., Michael Wonacott, Peter Ling, and Thomas Bean. Tailgate Safety Training for Landscaping and Horticultural Services: Tree Pruning and Ladder Safety, AEX-192.1.82. Columbus, OH: Ohio State University Extension, 2006.